The best Dungeness Crabbing on the Oregon Coast! you won’t find a cleaner, quieter spot for RVing, crabbing, fishing, boating… or just relaxing. Located less than two miles from spectacular Oregon beaches, McKinley’s Marina & RV Park is a terrific home base for exploring the beautiful Pacific Northwest. Whether you’re an RVer or a tent camper, or you enjoy boating, crabbing, fishing or scenic drives (or all of the above), McKinley’s is the perfect vacation spot! Our immaculate Oregon Coast RV sites have been totally renovated to provide the most comfortable camping you’ll ever see. Launch your boat at our ramp, or rent a well-equipped boat from our full-service marina, and enjoy the best Dungeness crabbing anywhere. We offer two distinct areas for campers to choose from. Our paved full-hook-up RV Sites offer waterfront camping at its finest. Whether you drive the largest Big Rig, tow a trailer or 5th wheel, or drive a pick-up camper, we have the perfect spot for you. Our long, extra-wide paved sites provide tons of slide-out room, 20/30/50-amp electric service, water, sewer, cable TV and FREE Wi-Fi. When we renovated the entire full-hook-up section of our Oregon Coast RV Park, we took your comfort seriously. The entire area is clean and level, with paved streets, RV pads and patios. We offer extra-long pull-throughs, plus sites that allow your choice of back-in or nose-in parking. Providing double hook-ups (one set on each side) allows both motorhomes and 5th wheels to face the water! McKinley's is the neatest Oregon Coast campground you'll ever see! For our tent-camping guests, and those RVers looking to economize, our huge grassy dry-camping area provides the perfect setting — directly on the water. Since we’re surrounded by water, we have so many waterfront sites that everyone gets to be near the beautiful Alsea Bay or River. Whichever camping area you choose, you'll be comfortable on our clean, well-maintained grounds, with native plantings and a truly peaceful environment. We’re proud to be one of the finest RV parks on the Oregon Coast, and our friendly, welcoming staff will make you feel right at home the moment you arrive. Not an RVer? No problem. 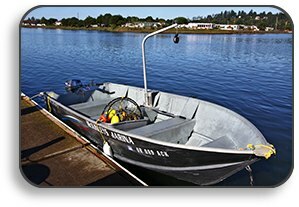 Our Oregon Coast marina and launch facilities are available whether you have your own boat, or rent one of our motorized crabbing & fishing boats. Our rental crab boats come complete with crab rings and baits, plus we provide a free crab-cleaning station for our guests and offer on-site crab cooking. Prefer to explore the beauty of the Alsea River Water Trail? You can launch your canoe or kayak at our very own on-site boat ramp. Our proximity to downtown Waldport, Newport, Florence, Yachats and other Oregon coastal towns provides lots of leisure opportunities. From golf and hiking, to scenic drives and lighthouse tours, you will find the Central Oregon coast the perfect vacation destination. There is so much to see and do, we've assembled a list of area attractions to help you start planning your visit. Taking advantage of the temperate climate along the Oregon coast, McKinley’s Marina & RV Park is open year-round. Regardless of which season you choose, you’ll find McKinley’s a welcoming Oregon coast camping destination. Our mission is to ensure that all of our guests enjoy their visit with us to the fullest. Come see why so many of them return year after year. Watch The New McKinley's Video! 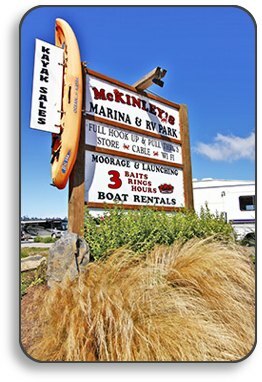 McKinley's — The Very Best Oregon Coast RV Camping!